Maneuvering 300+ pound hogs is a daunting task, not to mention exhausting, but there are simple things you can do to keep the pigs moving without stressing them—or yourself—out. 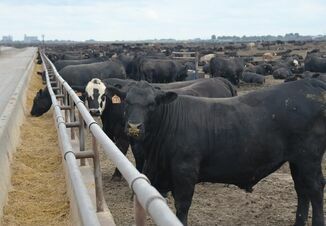 It’s estimated transport losses cost the industry approximately $46 million per year, which creates not only economic concerns but animal welfare concerns as well. These losses are due to a multitude of factors, such as, aggressive handling, overuse of electric prods, overcrowding, stress and extreme weather conditions. While you can’t do anything about the weather, you can control the level of stress the pigs experience during the loading process. Reduced stress safeguards meat quality, improves transport mortality and increases safety in the barn for both the loading crew and the animals. Here are some tips to improve hog loading while reducing stress. Presorting the pigs is a key factor in keeping them calm, along with reducing stress and fatigue. By moving the market-ready hogs to the front pens, they have a shorter walk to the chute and it will get them used to walking in the alleyway. Presorting should be done prior to loading and the pigs should also have an adequate resting period before getting on the truck to reduce fatigue. Keep calm and pig on. While it might seem silly, pigs react to your mood. If a member of your loading crew is stressed or angry the pigs will mirror this and become more difficult to handle. When you’re dealing with pigs, it’s best to focus on the job at hand and not let personal emotions cloud your mind and influence your actions. This will not only reduce pig stress, it will also keep the handlers from becoming inadvertently aggressive. 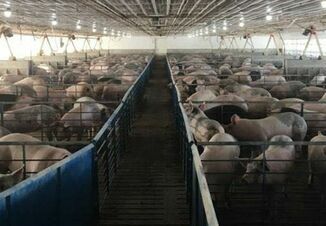 In most barns, three to four people in the barn should be sufficient for loading market hogs, depending on barn size and design. The key is to work together to create a human gate utilizing sort boards and sounds (calling, whistling, banging your hand on the board, etc.) to encourage pigs to go down the alley and into the shoot. Having too few people could result in chasing pigs, which is unsafe for all parties involved. Conversely, too many people can create congestion and increase turn attempts, creating confusion and stressing the pigs. In short, make sure the pigs are used to people. It's important to have pigs that are used to people being in the pens. This seems like common sense, but it’s a key factor to remember. Regularly walking the pens will allow the pigs to get acquainted with having someone in the pens with them. This will create a more amicable loading experience. Of course, genetics aren’t always your friend. Given, no matter how much you work with some pigs, they are just hardwired to be high strung. In these situations, you just need to do your best to reduce distractions and create an environment that won’t scare the pigs. Pigs also tend to follow other pigs, with this in mind, it’s sometimes best to point them in the right direction and let them make their own way to the loading shoot. 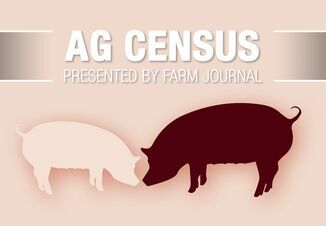 Pigs move best in pairs, so your alley should allow two pigs to move side-by-side until they get to the chute, where it should narrow into single file width. This reduces stress and creates an easier loading environment. According to "Handling Pigs," a university paper by Temple Grandin, Colorado State University and Collette Schultz-Kaster, Milan, Mo., making a chute too wide is a common mistake suggesting the ramp should be 34 inches wide with no more than 20 degree angle. Pigs have a wide range of view and can easily become distracted or frightened. Taking care to remove clothing or other flapping material from the pigs’ line of vision, ensuring the floor is dry, securing all doors or gates that could swing or slam shut and removing shiny objects from the loading area will help keep the pigs calm and reduce turn attempts. Another way to improve loading is to install solid gates to the front pins and along the loading area. If you don’t already have solid gates, you can create them with plywood and attach them to the front pins. This greatly reduces distractions and keeps the pigs focused on moving forward. By identifying distractions and common problems along with careful monitoring of the pigs and working closely with your loading crew, you can work to reduce stress and improve loading times all while reducing transport mortality. Pig health is key in pork production and loading is one of the most stressful experiences in a pig’s life. Small steps can make a big difference.